7 Active Share is a shared "online canvas" enabling voice agents to interact with a caller through rich visual web apps and collaborative browsing. 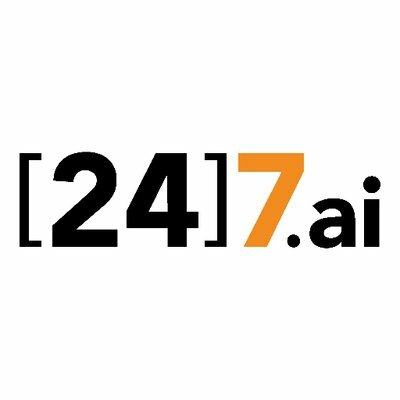 7 AIVA for IVR reimagines interactive voice response with with AI-powered speech. Reinvent your IVR with advanced natural language technology, more accurate speech recognition, and digital capabilities designed to help your customers help themselves. 7 Chat guarantees significant reduction in support costs by deflecting contacts from phone and email. 7 Chat uses intent-driven engagement and deep chat analytics to systematically enhance customer experience and improve agent effectiveness. This ensures a reduction in contact center spend while maintaining high CSAT scores and first contact resolution rates. 7 Customer Journey Analytics is an easy to use SaaS solution that tracks and analyzes the way customers interact with companies making it easier for enterprises to identify and act on complex customer experience issues across the customer journey. 7 Customer Journey Analytics ingests nearly any type of data (structured or unstructured) to build models of customer journeys (millions of them) across channels, products, services and lifetime and deliver rich insights into the customer experience. 7 Digital Chat Agents offer customers smarter, on-demand engagement that simplifies their journeys, especially when they cross channels or devices to complete a task. 7 Digital Chat Agents have digital skill sets and an outcome-oriented focus on helping customers complete their journeys. With more than 7,000 digital chat agents in six geographies globally, 7.ai assists consumers in every business segment. Operating from contact centers across the US, Central and South America, India and Philippines, their agents use industry-leading technology to consistently out-perform across metrics in every engagement. 7 Predictive Search Bidding combines big data analysis with high frequency bidding to enhance efficiency and turbocharge customer acquisition profitability. Plus, it integrates seamlessly with your existing system to optimize every bid, and every dollar. Bidding smarter to boost your paid search ROI has never been easier.